There’s a little-known supplement that has been in several scientific journals lately with some impressive results for benefits to memory and brain function. The supplement is an extract of French maritime pine bark, known as Pycnogenol (pronounced pick-nodge-eh- nol). It’s not a new supplement, but recently some remarkable results have been reported that I thought were worth sharing. In a yearlong study, seventy-seven adults aged 55 to 70 participated, and half the group was given 100 milligrams of Pycnogenol daily. At the end of the study, tests showed a seventy-two percent improvement in decision making in the Pycnogenol group (vs. a five percent decline in the placebo group). The attention span of the group that took Pycnogenol was increased by forty-one percent and memory improved by thirty-seven percent (compared to a ten percent decline in the control group). With such impressive results, I’m frankly surprised I haven’t been hearing about French maritime pine bark everywhere, though I haven’t, which is why I wanted to write about it here, particularly since the benefits were achieved by taking only one 100mg pill a day. Pycnogenol also has a wide variety of other conditions it has been researched for positive results and has been the focus of over seventy different studies over the years. Another condition that Pycnogenol has had impressive benefits for is asthma, and was found to help both children and adults without adverse effects. Researchers gave participants 1 milligram of Pycnogenol per pound of body weight and found benefits for improved breathing after only one month. Also, the Pycnogenol group was able to rely on their rescue inhalers far less often. Pycnogenol has also been shown to aid in lowering blood pressure, helping to normalize blood pressure readings in fifty-eight percent of hypertensive patients. Another study found that participants who took Pycnogenol were able to reduce their blood pressure medications after taking the supplement for 12 weeks. Other double-blind studies have reported Pycnogenol’s benefit for lowering blood sugar in patients with Type 2 diabetes. After twelve weeks of taking the French maritime pine bark, it was reported that the supplement, “significantly lowered plasma glucose levels” when compared with the placebo. Pycnogenol also improved blood flow and blood vessel health. 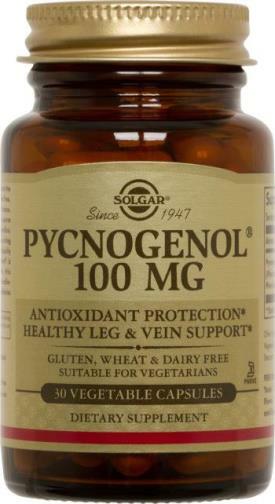 Pycnogenol by the company Solgar will be on sale for 25% off in November, so it’s a good time to try it!